What can you expect from Scuba Fun PADI 5 Star Dive Resort? Many Great Dive Sites, just a short boat ride from our Philipsburg Dive Center, including a historic shipwreck - the HMS Proselyte, which dates back to 1801 - you can still see the coral-encrusted anchors and cannons from over 200 years ago! Join us for a two-tank scuba dive every morning. Check in at our Philipsburg Dive Centre at 8.30 am. Contact us to reserve your place or book online with confidence on our secured booking page. 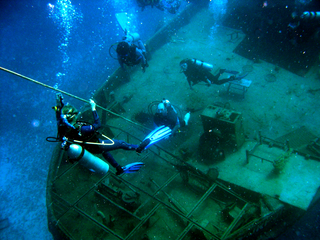 This dive is suitable for certified divers with recent dive experience. You forget your dive computer or you don't have one but you feel safer using a dive computer. You want to buy a computer but you want to try it first : you can rent the Aqualung i300 Wrist computer for only $ 20. If you decide to buy the computer we will deduct the rent fee from the computer's price, great deal ! With our two custom dive boats, our Philipsburg Dive Center is just 15 minutes away from some of the best scuba diving sites around St Maarten. Haven't been Scuba Diving in a while? 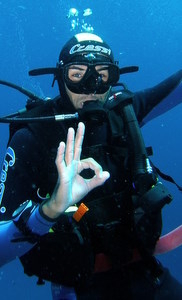 We offer a Scuba Review program every afternoon. 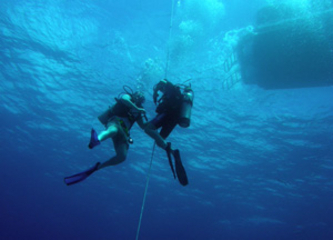 Refresh your scuba dive skills on a supervised shallow dive in a protected reef and wreck site. Then join us on a morning two-tank scuba dive trip to explore some of the many other dive sites around St Maarten / St Martin.